How the foie-gras laden dishes of Canada's "Wild Chef" breathed new life into Montreal's sugar shack traditions. Image via David Zilberman (L), Yelp/Claudine C.
On the 45-minute or so drive from downtown Montreal to Martin Picard’s Cabane à Sucre Au Pied De Cochon in rural St-Benoit de Mirabel, it’s easy to spot at least a few roadside sugar shacks. These maple-syrup season staples are as Quebec as winter and hockey. Every year, around the time the snow starts to melt, cabanes à sucre—sugar shacks, to my American friends—will be buzzing with life, music, horse carriage rides, and always that sweet and sticky gold poured on everything, including snow. 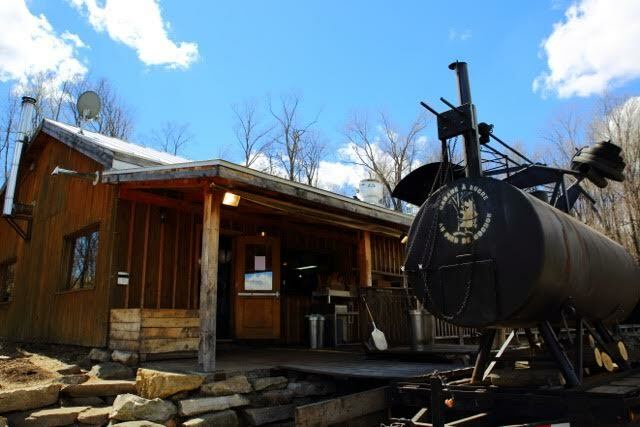 Most sugar shacks have been functioning the same way for generations, serving a traditional yet inviting spread of pork, pancakes, and beans. It’s still a beautiful part of Quebec’s cultural landscape and a must for any tourists who find themselves here in early spring. But when “Wild Chef” Martin Picard—the man synonymous with foie gras, and the one responsible for kickstarting a high-end Quebec comfort-food scene when he combined it with poutine at the original Au Pied de Cochon in Montreal—added his indulgent, gastronomic flair to the traditional sugar shack, it re-ignited people’s interest in the roots of cabane à sucre culture. Honoring the past, though, doesn't necessarily mean playing it by the book. You’ll still find pancakes at Picard’s sugar shack, only his will be fried in duck fat. And the tower of oozing foie gras? Well, that’s just part of the Picard experience that gave Au Pied De Cochon its status as a destination restaurant. Even though it’s a total dad joke, when Picard reaches for his side and says he has a “foie gras,” one can’t help but laugh and acknowledge there’s some truth to it. “What about your morning cereal?” I ask. “Okay, you got me there,” he says with a laugh. Even so, Picard's extravagant reinterpretation of the classic sugar shack stems from his love of the unpretentious—the meals, as he puts it, where he came in with no expectations, and was blown away. “You come in here, and everything is wood; people are dressed however they want,” says the bon vivant. But what can be said about the diners desperate for reservations, those who come to his sugar shack with near-impossible expectations? “Well, we take those people out back and bury them in the woods,” he says wryly. The job of re-examining your country's culinary past may be a serious one, but Picard proves that it's best done with a sense of humor. From white truffles in Piedmont, to a pivotal moment of kitchen insubordination spurred by a salmon tartare, here are ten seminal dishes that have inspired one of Canada's most important chefs. This recipe brings me back to 1989-90 when I was at Citrus, a Montreal restaurant where Normand Laprise (Toqué!) was the chef. It was my first thing after school at l’Institut de tourisme et d'hôtellerie du Québec (ITHQ). Normand taught and had a restaurant at the school. I saw him plate up, leaving a little bit of coulis on the corner, and back then you were expected to have all corners perfectly cleaned. A server told him he missed a spot and Normand angrily and charismatically said it was staying. I loved the guy from that moment and it’s why I wanted to work at Citrus. It was during the time when California cuisine was the biggest thing. It was a simple salmon tartare with lemon juice, olive oil, some French shallots and mustard. After that it was mixed with chives, and what made it incredible was we put avocado puree on it. There were also tarot chips. For a while it was my favorite dish. Around the same time, there was another Californian-style dish: salmon tournedos. You take a slice of salmon, you undo the strip a little, and you roll it. It makes a nice tournedo. You put it down on a grill at 90 degrees so it gets grill marks on both sides, like a real meat tournedo. And we cooked it till it was pink in the middle, which was different than before because everyone used to cook salmon till it was well-done. We thought it was out of this world extraordinary. And with that we had a sauce that was just lemon, grapefruit and orange zest, and just a bit of lemon to give it acidity. We added olive oil to it and then we made an emulsion out of it. It was really good and we served it with the salmon on a bed of spinach, if I remember correctly. It was end-of-the-world good to me. Today it’s nothing special, but back then we thought it was way ahead of everything else. It was disrespectful to think that way, because everything’s been done already in the kitchen, but when you’re young and full of testosterone, you might think that way. This is from Michel Trama at Lot-et-Garonne in France. In the beginning of the 90’s, I sent him a letter, and he ended up inviting me there to train. The pork was like these two cylinders, maybe an inch-and-a-half high and two inches wide. They were breaded à l'anglaise—flour, egg and breadcrumbs—but inside it was pork “ergots,” a part of the foot. There’s gelatin and tendons. What was great about it was there was this juniper oil vinaigrette. It was simple. We served it with girolle mushrooms that were cooked in a special way were you took them out of the muddy consistency you cooked them in and fried them in butter, and then after you added shallots and a drop of peanut oil. It was the cheapest thing on the menu. I trained three months there and when I was finished, because I wasn’t paid, they invited me to eat there. I decided to eat that, even if it was the cheapest choice. This was when I was doing an internship in Saint-Père-sous-Vézelay around 1989. It was a liquid foie gras that was imprisoned in a ball. Marc invented it, and it was genius. It was foie gras with cream and it was liquefied. He added a bunch of truffles, porto reduction, shallots, and at the end it was a liquid, so he put gelatin in it and once it congealed it became like a Jell-O. He cut it into pieces and ran it through three steps where it would end up being breaded. If one step was done wrong, the thing would automatically explode and you wouldn’t get the result you wanted. I make those balls today, but without the truffles since they’re too expensive. We do a Quebec twist on them with maple butter. Definitely a favorite foie gras dish of mine. Champlain Charest was best friends with Jean-Paul Riopelle the painter. He’s a radiologist and he was known for having the biggest wine collection in Canada. He’s a larger than life personality. There was one time we were hunting together when he started talking about “ploye,” which is like a crepe but with buckwheat. One evening, we had a bit of foie gras leftover from dinner that we decided to save for breakfast. My dad would eat buckwheat pancakes with potatoes, cheddar and bacon. Based on my dad’s and Champlain’s recipes, we combined them but added a maple syrup gravy with foie gras on top for the fun of it. It was a unique marriage. Some recipes you get right away, and others take a lot of tinkering and you improve upon them every time you make it. This one took two or three years. The thought was: if you remove the meat, the knuckles, and ergot too, add foie gras and a sauce made from the juice you cook it in, it’ll be good. At first, the hard skin was inedible. But after three years, we figured out a way to eat the whole thing. We had to find the right technique to do it. I still love to eat it, even though it’s rich and heavy. It’s inspired by the joy I felt nibbling pig bones in France. A classic, but instead of ground meat, I do it with fatty beef cubes so it’s soft. Grain-corn. Creamy. Mashed potatoes done Au Pied de Cochon-style, so a puree with cheese curds and garlic. Steak, corn, potatoes—you know it. It’s a Quebec classic and I have fond memories of eating it when I was a kid, but to be honest the version we do is way better. I used to sometimes put foie gras on it too…but I’ll stop talking about foie gras. This one I had at Piedmont in Italy. I did an internship there. I was there primarily for the white truffles. The first night I was there, I had pasta with white truffles, and in all its simplicity it remains one of the greatest meals I’ve ever had. People will never get bored of precision and simplicity in the kitchen. It was just an extra thin mirepoix without celery, with olive oil and deglazed with a vegetable juice. Parmesan and truffles on top. It was an egg pasta and because eggs are more orange in Italy, the pasta is yellower compared to here. It was a rare moment where I didn’t know what I was eating, but it didn’t matter and I didn’t ask questions. A cotechino sausage, and around it is the veal and prosciutto. You pound the veal and you roll it, and it’s cooked for a long time with parsley and shallots. Cook it in the veal base and white wine. The sauce becomes very concentrated at the end, but it’s still a juice because there’s nothing to thicken it. It’s served with polenta—very simple. For a year I gave cooking classes with (Montreal chef) Elena Faita at her school. This was her dish, and while I was trying to be delicate in making it, she was way more animated than me. Afterwards we would eat it altogether and Elena showed me a lot about conviviality in cooking. She’s been a big influence.